November 2008 Archives - mudd up! lively discussion & lovely old tunes with Ian Nagoski (compiler of Black Mirror) on the radio this past wednesday. 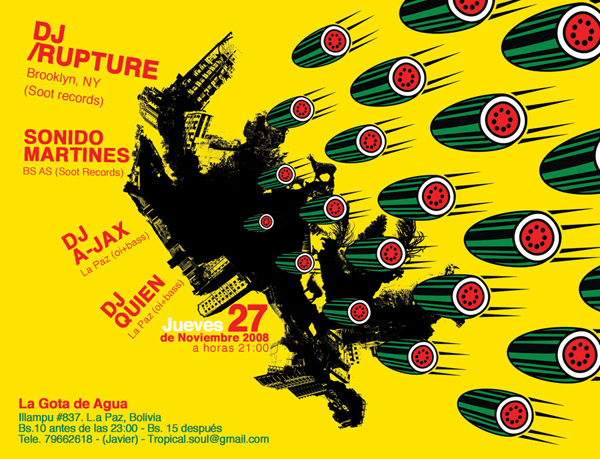 Sonido Martines next week. Bolivia is worth visiting because, from the little I have seen and understood, it is very much itself and unlike other places I have seen. Today Sonido said “I think El Alto is the most futuristic city in the world” and I think he’s right. We’ll try to elaborate. Busy days. link to blurb. link to PDF. In addition to a sidebar with translated chunks of the Fader piece, the article talks with Lescano talking about me talking to him (media feedback loop), and what it means for The Fader to cover this unexpected genius, pictured below with a culo real and his “100% black cumbiambero” tattoo. excerpt: Lescano había pasado la noche anterior con un “periodista de Nueva York” al que había llevado a los bailes “para que alucinara”. “Claro, imaginate que él iba a Niceto donde pasan cumbia mezclada con electrónica, o reguetón. Después un poco de rap, después un cachito de cumbia, y reguetón. Es un invento bárbaro. Yo le dije ‘vení que te llevo’, y me lo llevé a Fantástico Bailable, a Jesse James y un par de lugares más. ¡El chabón no lo podía creer!”, cuenta Lescano, en su departamento con vista al río, sobre una avenida de San Isidro. negros”, como dice el lomo de Pablito, en letras tatuadas. que se llama Pablo Lescano. a new piece of mine on rai, in The National. Yalla! and another in n+1. about… how the international DJ thing works? The article isn’t online. Issue launch party in Brooklyn tonite. And then I’ll be leading a 2-day hiphop production workshop for some young producers/MCs in El Alto. There’s a lively scene of indigenous kids rapping in Quecha & Aymara. the following week we’ll head over to Lima for 3 more events, more in a bit. also, NYC-side: tomorrow fri. nite Badawi is playing @ Dub War and Uproot Andy & Feliz Cumbe are playing at Bowery Poetry Club. I just received the new final Skull Disco /Shackleton 2-CD with remixes by Badawi, yrs truly, and a bunch of others and its got some great moments, Raz’s treatment is expansive… deep. Samuel Delany and Junot Diaz reading in NYC this monday! SPECIAL NIGHT! With Junot Diaz (The Brief Wondrous Life of Oscar Wao) and Samuel R. Delany (Dhalgren, Dark Reflections). Reviewing nonexistent books is not Lem’s invention; we find such experiments not only in a contemporary writer, Jorge Luis Borges (for example, his “Investigations of the Writings of Herbert Quaine”), but the idea goes further back – even Rabelais was not the first to make use of it. 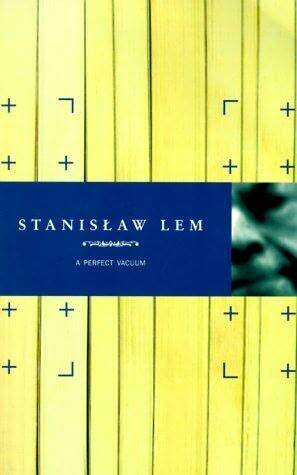 A Perfect Vacuum is unusual in that it purports to be an anthology made up entirely of such critiques. Pedantry or joke, this methodicalness? We suspect the author intends a joke; nor is this impression weakened by the Introduction – long-winded and theoretical – in which we read: “The writing of a novel is a form of the loss of creative liberty. . . . In turn, the reviewing of books is a servitude still less noble. Of the writer one can at least say that he has enslaved himself – by the theme selected. The critic is in a worse position: as the convict is chained to his wheelbarrow, so the reviewer is chained to the work reviewed. The writer loses his freedom in his own book, the critic in another’s. “You’re one of the most interesting people I know!” I tell her, again. But she doesn’t believe it. She started surveilling her neighbor – to see if his life is as boring as hers is. Rise of the Singing Robots – David Decks on autotune. I Like Listening to Awesome Tapes from Africa – Andy Moor. this Saturday New York, you’re invited to the opening of “Twentyfirst”, a group (art) show I’ve got a collaborative piece in. Other artists include: Fritz Haeg – the greatest gardener of our time (no joke ! 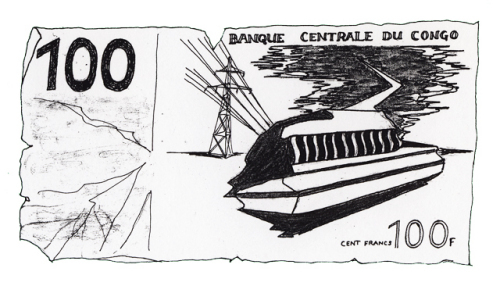 ), The Center For Land Use Interpretation, Haegue Yang, Rocío Rodríguez Salceda, Mariana Mogilevich, and more. 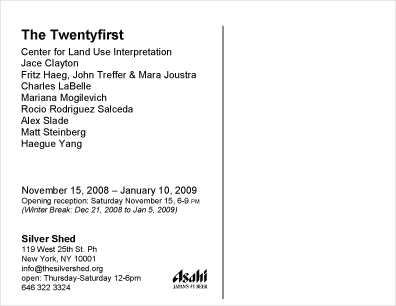 Twentyfirst @ the Silver Shed on 119th W. 25th st ph. this is an indicator of my level of busyness. I am just now listening to a CD i personally bought up in Harlem nearly 3 weeks ago, called Amadou Barry – Super Accordeon. It cost $3 and the store where I got it is open 24-hours. They mostly sell phone cards and dvds. On the ultra-xeroxed cover Mr Barry is wearing a v-neck t-shirt printed with a large picture of a black woman’s foot. She’s in dark heels with a red flower and matching toenail paint. There is no leg. Barry looks worried, startled, purposeful, intent. “Demi-Talon” is what his shirt says. tonite, Tues November 11, Williamburg, I’ll be joining residente Geko Jones @ the new QUE BAJO party. Cumbia fans come through! I’ll be playing exclusively cumbia colombiana and cumbia sonidera (read: no crunk cumbia, no mashups, etc). Just that sweet slow shuffle. I’ve been digging deep into sonidera lately, finding a lot of El Hijo de la Cumbia production on CDs floating around the Mexican sonidera scene in Brooklyn shops. They never list the producers, but his style stands out. Here’s one I found last week. Vox by La Contra. Princess Music at 6919 5th Ave in Bay Ridge (Bay Ridge: R stop) is the best Arab music shop in Brooklyn. Don’t get me wrong: it’s not good. It simply happens to be the best, because the competition is even worse. Princess has some headless black Sambo/Aunt Jemima style ceramic figurines too, although they’re not for sale – they’re decoration. Good thing Beur.Fm has internet streaming! Beur Fm is a powerful nationwide FM station in France with a satellite broadcast so family back the in the bled can listen in. They have 5 internet streams: the main station, 100% Maroc, 100% Rai, 100% Kabyle, 100% Orientale, and a new one called Ramadan. Song and artist (metadata) info on all channels except 100% Maroc… That said, I can tell you that the song right now is by Jil Jilala… with Moulay Abdelaziz Tahiri on guembri. I recognized his stride immediately… so clear. This moment arrives bookmarked by music I can neither recognize nor remember // beauty dovetails drift, also the way smoke works, hope rolled up and burning. to know little. to listen.